Cotton classification, or classing, is the process of describing the quality of cotton in terms of such properties as grade, staple length and micronaire. In the past the classing of grade and staple was done by hand and eye. Now, all cotton quality characteristics are measured by instruments. 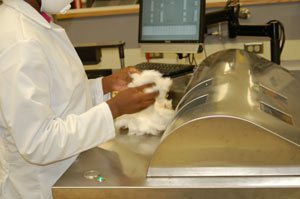 Classification is essential to the cotton pricing systems and is required for high-level quality control in textile production. The high-volume instrument (HVI) system was developed to objectively measure important fiber properties. The HVI classification system currently consists of instrument measurements of fiber length, strength, length uniformity, micronaire and color, as well as the presence of extraneous matter (trash). Since 1991, 100% of the U.S. crop is graded by the HVI system. The three cotton fiber properties most often considered in nonwoven applications are micronaire, length and strength. Neps may also be considered for applications where visual appearance is important. Micronaire is an airflow measurement of fiber fineness. It is performed on a weighed test specimen, which is compressed to a specific volume in a chamber. Air is forced through the specimen and the resistance to the airflow is measured. This resistance is proportional to the linear density of the fibers (expressed in micrograms per inch), adjusted for the maturity of the fiber (because micronaire and maturity are highly correlated within each cotton variety). If the exact linear density of the fibers needs to be determined, the maturity of the fibers must be determined by another measurement. On a typical year, the micronaire range for upland cotton is 3.0 to 5.5. Because denier is approximately equal to micronaire divided by 2.82, upland cotton ordinarily ranges from about 0.7 to 2.3 denier. Cotton fiber length varies genetically and any sample of cotton fiber shows an array, or distribution, of fiber length. The HVI reports fiber length as the mean length of the longer half of the fibers in the sample (the upper-half-mean length) in hundredths of an inch. Figure 1 shows a typical fiber length array. Fiber lengths normally are between 1.0 and 1.25 inches for U.S. upland raw cotton, as long as 1.6 inches for Pima cotton, and less than 0.5 inches for linters and comber noils (the portion of shorter fibers removed by the combing operation). The HVI system measures fiber strength by clamping a bundle of fibers, with 1/8 inch between the two sets of jaws, and measuring the force required to break the fibers. Results are reported as grams per tex or grams per denier. A “tex” is a unit equal to the weight in grams of 1,000 meters of fiber. Therefore, the strength reported is the force in grams required to break a bundle of fibers one tex unit in size. A “nep” is a small knot of tangled fibers, often caused biologically or by mechanical processing. Neps can detract from the visual appearance of fabrics by causing white specks. Neps can be measured with the Zellweger Uster Advanced Fiber Information System (AFIS) nep tester and are reported as total neps per gram of cotton and mean nep diameter in millimeters. Nep formation during processing can be minimized through the use of appropriate equipment and settings. The AFIS equipment can also be used to measure fiber length and trash content. It is very effective at measuring small amounts of residual trash present in bleached cotton. Another instrument useful in measuring non-lint content of bleached cotton is the Zellweger Uster Micro Dust Trash Analyzer (MDTA). This instrument separates a 10-gram sample into lint and non-lint components and reports the non-lint as percent trash (> 500 µ), percent dust (< 500 µ), and percent fiber fragments. Each of these three components is collected for visual inspection. Table 1 lists the data obtained by the AFIS-M and MDTA-3.